Racold, India’s largest provider of water heating solutions launched a new range of water heaters with Classico Swift today. A unique offering, Classico Swift is a perfect package which combines power with compactness to cater to the needs of the urban consumer. As acceleration takes hold in metros, there is a need for constant product innovation to support the fast-paced lifestyle of urban residents. The urban existence today is governed by time and space; while cities continue to grow; household space and people’s time continue to diminish. 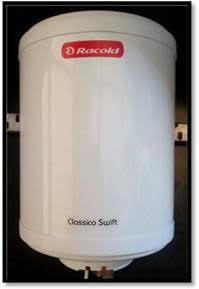 Recognizing this , Racold, created Classico Swift that is a super fast water heater which comes equipped with a 3 KW heating element which heats water 33% faster , resulting in time and energy saving. The Classico Swift is a compact water heater, available in both vertical and horizontal installations, which can easily fit into the urban home structure. The titanium enamel coating in Classico Swift provides extreme protection from corrosion durability, compression and pressure resistance. This feature also increases efficiency and reduces energy consumption. Commenting on the launch, V. Ramnath, Managing Director, Ariston Thermo India Private Limited Thermo Private Limited, said, “As a frontrunner in India’s water heater industry, we are constantly evolving with the changing needs of our customers. The Classico Swift has been designed keeping in mind the requirements of our customer base that predominantly resides in cities. It is a first of its kind in the mid-segment category that offers a perfect amalgamation of comfort, convenience and superior energy efficiency. The new offering is yet another testimony to our ability to build products which are backed by consumer insights”. Available in 6 liters & 10 liters –Vertical and Horizontal Installation with superior power rating of 3KW, the Classico swift range is a sensible choice for those who want instant heating facility and ease of installation. The Classico Swift is priced at 6440 onwards and is available at all leading electric and sanitary ware stores across the country. · Compact Design: Compact and utilitarian design developed keeping urban bath-spaces in mind, with options in vertical or horizontal installations. · Titanium Plus: A special titanium enamelled heating element gives better protection and longer life. · HPR: Its high pressure withstanding capacity makes it suitable for high-rise buildings and high-pressure pump applications. · Rust proof: Rust proof outer body prevents corrosion leaving no room for rust which ensures long life for the water heaters. · Smart Guard: A special anode used with the heating element employs an electrolytic process that protects the heating element from corrosion, thus greatly enhancing its life.